These headphones from Audio-Technica, Bose and Plantronics offer private listening and calling for a reasonable price. Whether you're in seat 24B flying to Cincinnati, getting some work done in your local coffee shop or toiling away in a cubicle farm, headphones are essential equipment if you don't want to bother -- or be bothered by -- those around you. These are actually three different types of headphones. 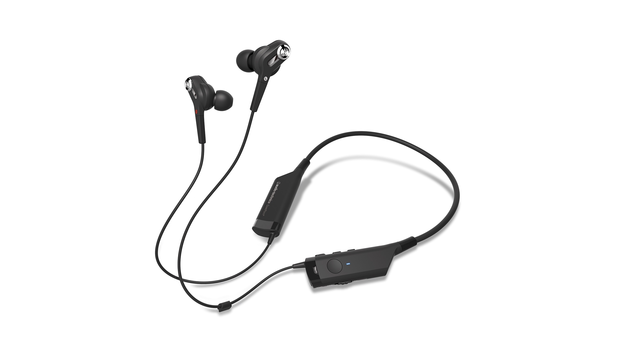 The Audio-Technica QuietPoint unit is billed as in-ear headphones -- what many people call earbuds, but with more electronics than most of the cheap earbuds on the market. The Focus UC is a set of on-ear headphones; they rest on your ears without surrounding them. 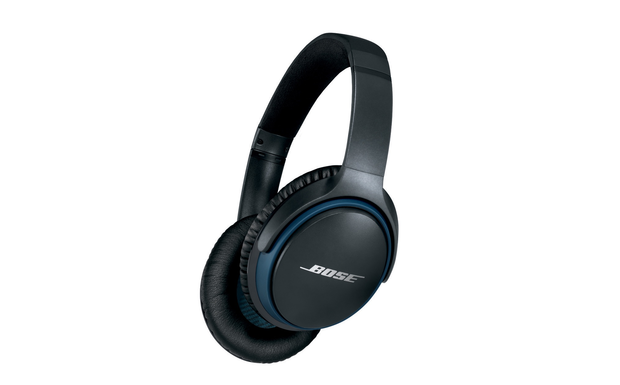 The Bose SoundLink II is more traditional; as over-the-ear headphones, they completely cover the ears. All three include built-in microphones, so they can be used for phone calls as well. In today's busy and noisy environment, it's often helpful -- in fact, liberating -- to be able to shut out the world and use your favorite music to help you concentrate. These headphones offer the freedom to listen to your favorite audio tracks without disturbing others, while being ready to take or make a call. The Audio-Technica in-ear QuietPoint headphones are seductively small, light and inexpensive. At only 1.2 oz., the QuietPoint headphones, $185 (Amazon price), are featherweight compared to the 7-oz. SoundLink II or the 5.4-oz. Voyager Focus UC. They come with a drawstring bag, a USB charging cable (but no AC adapter) and a micro-USB-to-headphone jack cable so that you can use them with non-Bluetooth devices. They also include an old-style double-jack airline headphone adapter. On its website, Audio-Technica describes QuietPoint as headphones, but since the earpieces go into the ear, they're probably better classified as a set of upgraded earbuds. The device has a neckband that holds the electronics; at each end of the band is a 2.5-in.-long module and a thin 9.5-in. cable that connects each earbud. The left module has the system's microphone and controls. There's a prominent power button for turning it on and pairing it to a phone, tablet or PC as well as an LED. There are also buttons for increasing and decreasing the volume, taking a call and turning the noise-cancellation circuit on and off. It uses a micro-USB port for charging the battery. The QuietPoint headphones come fitted with medium-size silicone ear inserts along with a small bag containing sets of extra small, small and large inserts. Once I had the right size, I found that the earbuds stayed in, even if I shook my head. The unit felt light and the buds fit well, but I found it hard to get used to the neckband. Getting the QuietPoint connected via Bluetooth took about two minutes. You have to hold the main button down for at least 10 seconds to put them into pairing mode; the LED blinks red and blue to show that the headphones are ready to pair. Pairing worked on the first try with all of my devices. On the downside, their range was limited to 25 feet, the shortest of the group. With the ability to reproduce audio between 20 and 24,000 hertz, the QuietPoint headphones' sound quality was adequate, with surprisingly strong reproduction of spoken word programming and percussion in classical music. However, treble tones were over-accentuated so much that brass instruments were annoyingly hollow at times. And the headphones were lacking in the midrange tones, particularly when listening to rock, folk and jazz. I tried the noise-cancellation feature, but couldn't discern any difference -- perhaps because earbuds don't do as good a job as on-ear or over-the-ear devices in isolating the user's hearing from the environment. I was not impressed with the quality of the phone calls I made. Of the three it was the least loud, and voices on both ends of the conversation were distorted and weak. At times, phone calls sounded like they originated in a shower. One place where the QuietPoint headphones excel is in battery life. In testing, they achieved 10 hours and 10 minutes of continuous playback with interruptions every hour to talk on the phone. That's 10 minutes longer than the SoundLink II and more than two hours longer than the Voyager Focus UC. On the downside, there's only a single blinking-light warning when you're almost out of power -- too late to help if you're on the road. The QuietPoint headphones are the least expensive, the lightest and the longest lasting of the three audio devices I tested. However, their audio quality was not rich enough for my taste. Bose is known for its audio quality and the SoundLink II headphones didn't disappoint, even though they are (for Bose) relatively inexpensive. Made of hard plastic, the SoundLink II, $280 (vendor price), feel sturdy and well-made; they are available in blue and black or white and brown color schemes. The package includes a travel case, charging cable and a headphone cable for use with devices that aren't equipped with Bluetooth. Despite their 7 oz. weight, the headphones felt surprisingly light and airy on my head and stayed put when I bent over, shook my head or sneezed. The inside of each ear cup is marked "R" or "L" for easy identification; a replacement set of the protective pads costs $25. The back of the right cup has the SoundLink II's power switch and microphone, while along the edge of the cup there are buttons for raising and lowering the volume, as well as a control key that lets you switch between music and phone modes. I found all the controls to be easy to figure out and use. On the bottom of the right cup is the headphone's micro-USB port for charging. The left cup has a standard headphone jack for using the SoundLink II as wired headphones with the included cable. Unlike the other devices reviewed here, the Soundlink II headphones offer two ways to connect through Bluetooth. First, you can put them into pairing mode by holding down the power switch after you've turned the unit on; this took about 90 seconds. If your tablet or phone has Near Field Communications (NFC) built in, you can also tap the phone or tablet on the back of the right cup and the connection is made. It worked like a charm with my Galaxy S6 and took all of 20 seconds. Once paired, the SoundLink II headphones were able to stay connected for 40 feet before their audio started to break up, slightly shorter than the Voyager Focus UC's range. They automatically reconnected when I got back in range. The unit has a computer-generated voice that tells you the battery strength, when you're ready to pair and when you're paired. Bose has a free Connect app for iOS and Android devices that lets you monitor what devices are paired to the SoundLink II headphones. The app shows the battery level, gives step-by-step pairing instructions and shows what device the headphones are currently paired to. Bose does not publish its frequency response range, but the SoundLink II's audio balance was the best of the three devices reviewed here, offering full midrange tones without losing audio details. String sections were sharp and vivid, while percussion segments were strong without booming, and guitar work was rich and lively. More to the point, the SoundLink II delivered the best audio experience of the three, regardless of whether I was listening to classical, folk or jazz. SoundLink II's microphone is in the right cup and produced much more volume during phone calls than either the QuietPoint or Voyager Focus UC; Bose's headphones also had excellent and balanced audio that sounded even better than my phone. Oddly for a company that is known for its active noise-reduction technology, the SoundLink II headphones aren't equipped with active noise-reduction. However, I found that the ear pads effectively muffled most outside noise, effectively isolating me from the environment. In fact, putting them on with nothing playing quieted everything significantly. The battery lasted for 10 hours of continuous music with hourly stops to make calls. That's 10 minutes shorter than the QuietPoint, but several hours longer than the Voyager Focus UC. The device has a rudimentary battery gauge: The battery logo glows green when the unit is fully charged and then changes to amber at 50%; it blinks red when you have about 15 minutes left. From audio quality to phone calls, the SoundLink II headphones put it all together with style and grace.